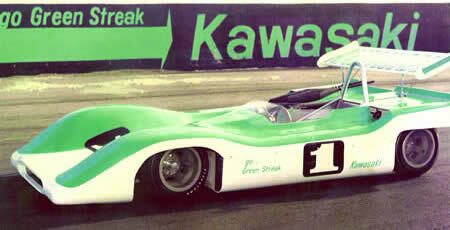 "Do you remember the Kawasaki race car? No, I didn't either. 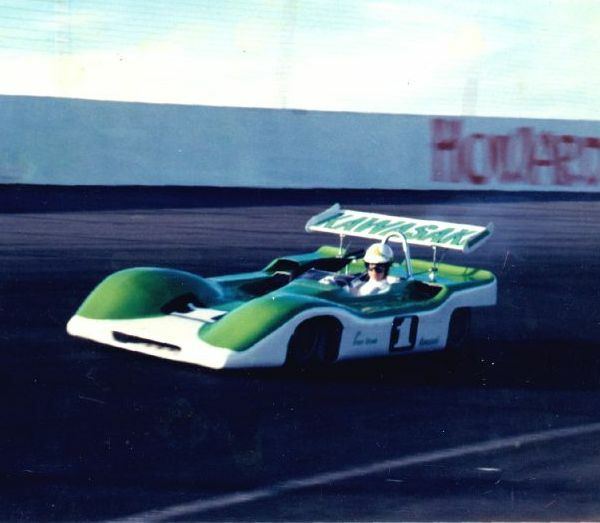 Kawasaki makes powersports products, � motorcycles, personal watercraft, ATVs, they make small engines and power products, industrial equipment, too, � but when did they ever build a race car? Few seem to know very much about Kawasaki's early years in the States. Entering the U.S. in the mid sixties, they were looking for a way to make a profit on the motorcycles they were already building in Japan. They started with a very small core of American employees, only four or five to begin, to build up a dealer base in the U.S. and to give a little guidance to Kawasaki on potential models for this new market. One of those first employees was Darrel Krause. 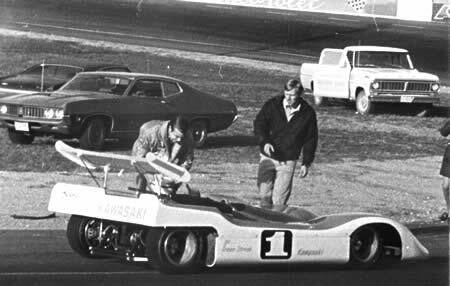 Darrel commissioned an early marketing plan in 1966, went on to set two AMA speed records at Bonneville in 1967 on a Kawasaki 250 and managed their early racing teams in the U.S., too. His many contributions to Kawasaki continued, one of which was to help set up the engine division in Minneapolis around 1970. 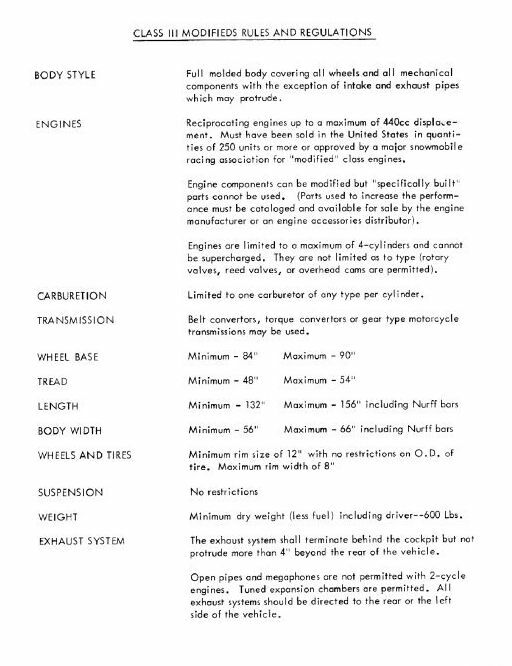 Kawasaki's small engine division was doing alright making engines for Arctic Cat snowmobiles, which were being successfully raced, but they wanted to expand further. 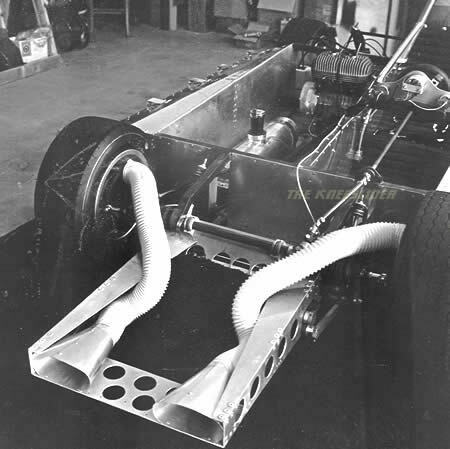 In 1972, as a way to gain positive exposure for their engines, while generating a bit of new demand, they came up with the idea of using these engines in a race car for a whole new special race series, sort of a summer continuation of the winter snowmobile racing. 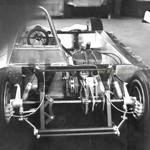 Darrel hired a racer and car builder by the name of Harvey Aschenbrenner to build a car using Kawasaki's 440cc two stroke two cylinder snowmobile engine. 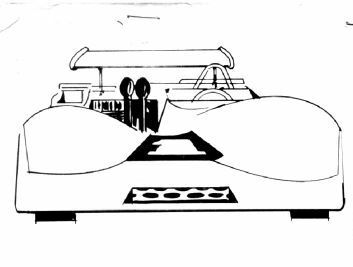 The design concept they had in mind was along the lines of a mini version of the Can Am racers which were very popular in those years. There was a snowmobile show coming up in just over 3 months and they wanted a show car, using the engine, ready for display. When Harvey was told what they wanted, he sketched a �blueprint� on the back of a time card, showed Darrel the sketch and got an immediate go ahead. Harvey built the car the old fashioned (pre computer) way. You made a sketch, roughed out the measurements, got some metal and went to work. 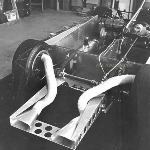 He built an aluminum monocoque tub with square tubing for the sub frames. He preferred round tubing but square was what he was told to use so square it was. The aluminum sheeting was bent over the edge of the workbench. A small machine shop down the street made hubs and spindles while the local salvage yard sourced the rack and pinion steering and other minor parts. Harvey then built wooden bulkheads and constructed the foam plug for the fiberglass body which was laid up and finished by a local fiberglass company. Though Kawasaki had both a 3 cylinder 650cc engine and a 4 cylinder 800cc engine at the time, they wanted to use the 440cc racing engine. 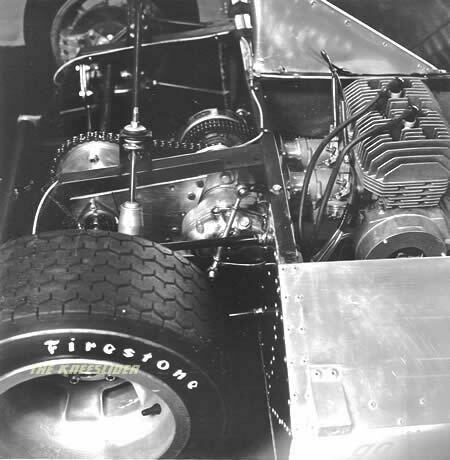 The transmission they had available was from an early motorcycle so Harvey came up with a way of adapting it to the engine and also figured out a gear ratio to take into account the 13 inch wheels with Firestone tires being used on the car. 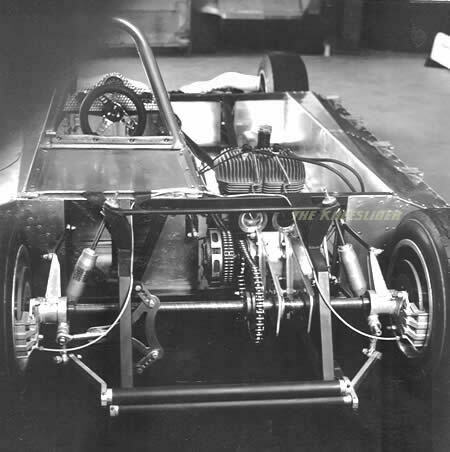 It was quite a guessing game since the bike contributing the transmission had taller wheels plus a four stroke engine with power starting down low while the car was a two stroke, power beginning up around 8000rpm. Amazingly enough, everything came together and with about a week before the snowmobile show, Darrel lined up some track time at Elco Speedway for a photo session and shakedown run. Out on the track, they found the gearing was way off but managed to get the car going anyway and Harvey got up to speed. After a couple of laps the car broke loose, he did a 360 and the engine died. The photographer ran over and said not to move the car because it was right in front of the Kawasaki sign and that’s where the top color photo you see above was shot. After the snowmobile show that weekend, where the racer generated a lot of interest, they removed the transmission and replaced it with an axle clutch that would engage at 7000rpm trying to compensate for the badly misgeared original drive system. After a bit of tinkering and practice laps, Harvey clocked a lap of 14.56 seconds on the third mile oval against a track record of 14.54. Not bad at all! They went back to the shop where Harvey tore the drivetrain down to install a torque converter to fix their power problems once and for all but just after everything was completely disassembled, Kawasaki told him he had to have the car at Laguna Seca for a demo run during the upcoming motorcycle races in two weeks. It was a five day drive from Minneapolis so they had just one week to build and test a new drive system and construct a trailer and paint it. It turns out, there wasn’t time to test. The demo didn't go well. Firing up the engine they immediately blew a piston and had a replacement flown in for the next day. They got the engine running but the new drive system had not been set up at all and after two 50mph laps they trailered the car and went home. Harvey felt the day had been a complete disaster. Photographs from the track, though, had generated a lot of interest because back in Minneapolis they began getting a lot of calls. They decided to build more of the cars so Harvey began building more chassis parts. 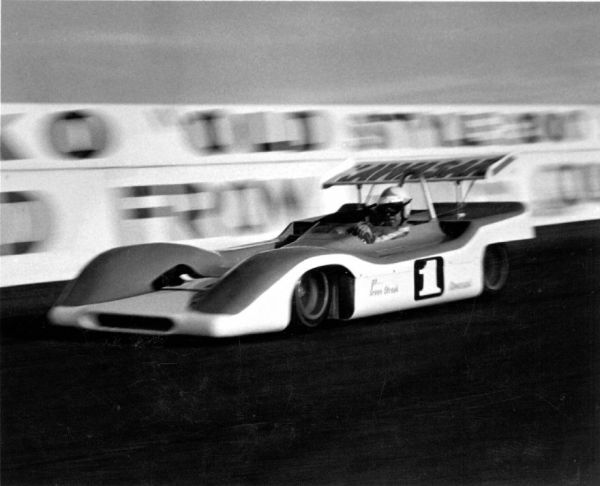 They prepared to move ahead with a partner who promised to machine a number of castings while Harvey went to Florida for some engine testing, but when Harvey returned six weeks later, nothing had been done. At the same time, Kawasaki had more projects in the works and Darrel, who was moving to California asked Harvey to move out too, which he did. The race car project was left hanging and in the hands of the partner, and, though there were a few attempts to revive it, never quite got back in gear after a very promising start. 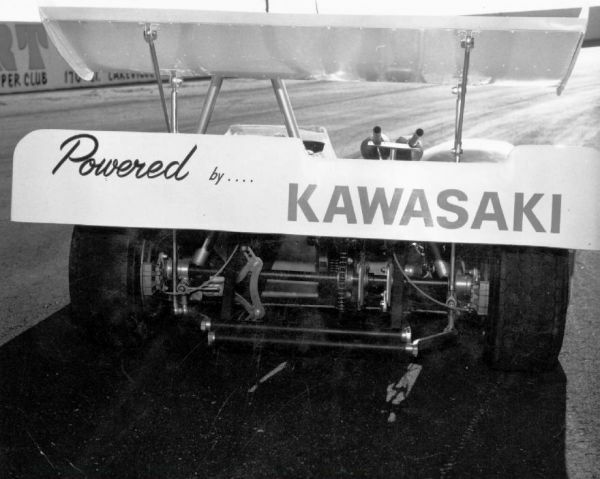 1Photos provided by Harvey Aschenbrenner and pulled, along with the text, from Kawasaki Factory Auto Racing, TheKneeSlider.com website. 2Photos cropped from a scan linked in the Darrel William Krause biography, PloyRadial.com website.